An early bustle petticoat AKA "fluffy!" Do you lack undergarments for the eras you want to recreate? I do. It is completely scandalous but there you have it. I lack underpinnings to form the foundation of the lines I want to achieve. 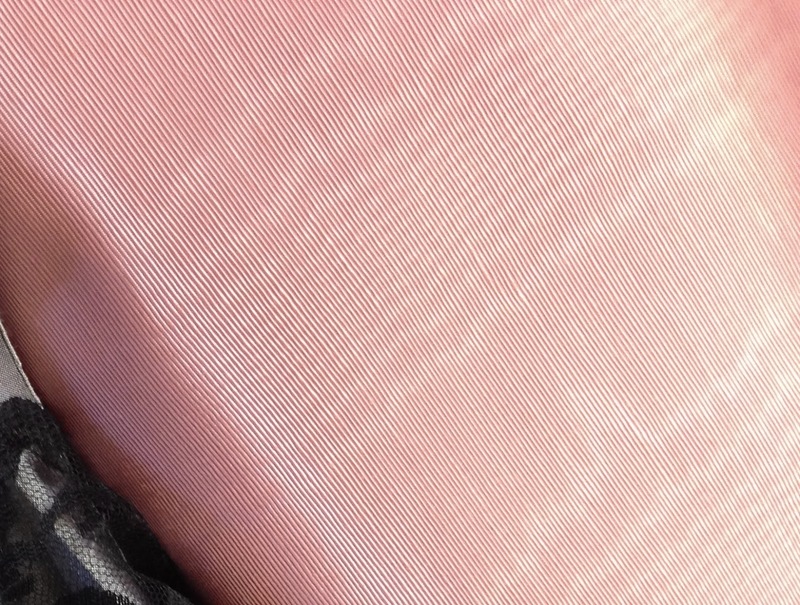 So with that imagery in mind can you just imagine my stunned over excitement when Kat of Madame Modiste offered me the perfect shade of raspberry moire fabric? She took it off her shelf after I complimented it and plopped it in my lap. "Here ya'go." she said to me. "Whaaaaaaa!?!" I said or something practically that eloquent. If you get to know me well enough you might notice that I can freeze when shocked. I think I tried to say no, I probably didn't try very hard (because inside I was already petting it and feeding it and calling it George) and ever since that day I have had the desire to make a Sherlock dress rolling around in the back of my brain and hopefully give Kat the joy of seeing that fabric become something at last! First I wanted to make a dress that would be clearly recognized as a Sherlock dress, but I had no desire to make a satin blah recreation of the movie dress which frankly fell short in absolutely every way except for the drool worthy color. seriously- could we get more boring? Still LOVING the color though. Here are the fashion plates that over the years keep ending up on my short list for this project. 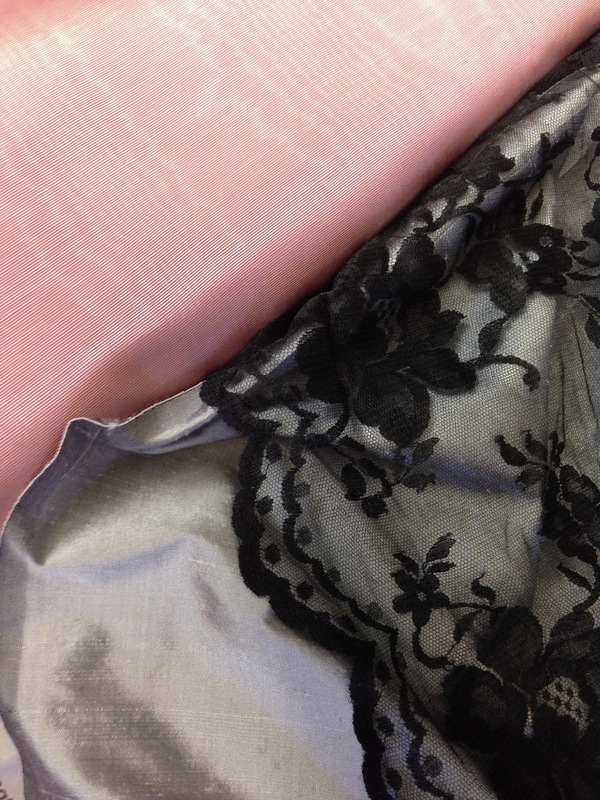 This one (left) has the amount of contrast I want and the floral pop like the cape in the movie dress appealed to me. More than the dress the coat on this dress (left) had an edgy Steam feel to me. This dress (right) had a military bent to it which is just me wanting a military dress but I do like the contrast ratio of trim to dress. 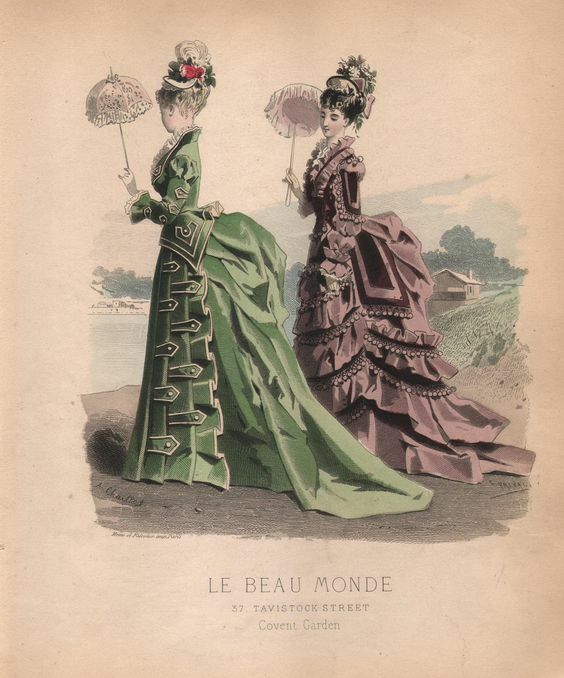 (right) I love the contrast, it's 1880's big ole' bustle which I was focused on and seemed to me like something a sassy Adler would wear. This was the dress I had been pretty well set on. But then the urge for early bustle and this fashion plate teamed up and beat me into real motivation to make this dress! (left) I love every little thing about this dress! The tabs- the buttons- the collar- the sleeves- all of it. Here is how it happened... Do you ever notice that the events you attend start dictating the dresses you make? That the authentic list of "I want this dress!" gets pushed aside, pushed back, and left to languish in the corner while you spend your time making "this dress will work for the event" dresses? It happens to us all at times I think, but it seemed to me like this trend had become my costuming life and it was sucking some of the joy out of it for me. After the recent pink tea dresses (three of them- three!) in a shade of 1980 rose pink I would never choose in a million years- I snapped. "Sherlock is happening, all upcoming events not withstanding- I may be wearing it to Dickens instead of a fur trimmed Victorian but I don't care! I'm making it! No power in the verse can stop me! I can kill you with my brain!" You get the idea. So after my super jolt of motivation and creative juice set in I realized I have none of the undergarments I want for this dress. So instead of waltzing to my closet and pulling out two petticoats, a beautiful satin corset, some cheeky cute drawers, an elegant chemise, and making my dress- I'm making a whole set of undies first. I REALLY need new underpinnings anyway so I'm excited about it and not feeling like it is a set back. Enter "Fluffy" I wanted to start with a petticoat. It needs to be early bustle and trained. I wanted it to have a pretty high degree of fluff because the moire' fabric for the dress is fairly heavy fabric and wimpy petti's just won't do. This petticoat is unusual in that it is made from a floral print Pima cotton (this fabric started life as a king sized sheet set from target.) I have found several extant and fashion plate images that clearly show floral cotton prints during the early bustle years but none of an actual petticoat. I still hope for validation of the fabric choice but until then - I made it with this fabric because It's pretty and I wanted to! I did find these great printed drawers from the MET and I will continue to look for an extant petticoat but this was enough validation for me! Moving on! 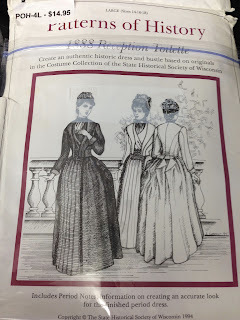 I used the Truly Victorian 208 pattern for an early bustle skirt. I made no changes to the pattern for the petticoat as I typically need to lengthen TV skirt patterns by two inches in theory the pattern length as printed should be just right for a petticoat and slightly shorter than my skirt. 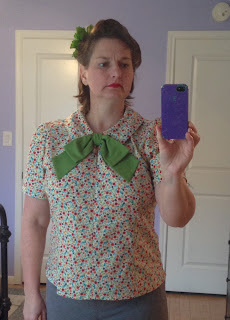 I used this image as a guide for the placement of the ruffles and puffing. My puffing is much fluffier by intention. The ruffles took forever! Seriously, I remembered why I don't ruffle often. The circumference of the skirt os 160 inches and I ruffled at a 3:1 ratio for the three bottom rows. my machine being eaten by ruffles! My puffing row is gathered at a 2:1 ratio. I drafted the waistband for the petticoat myself. I had the idea that it was a pointed waistband until I referred back to my inspiration image. So I corrected the front of the waistband to a curved shape. I still need to add the last bit of ruffle to the top row and the waistband but I am so pleased with this petticoat so far. Next I will be making some cutie floral drawers and a lavender corset. Lord Beckett stops by to inspect the studio. It feels really good to be making something just because I want to - I don't have an event in mind for this dress but I am so excited to be making it at last. Are you making something just because you want to this week? September flew by in such a whirlwind! 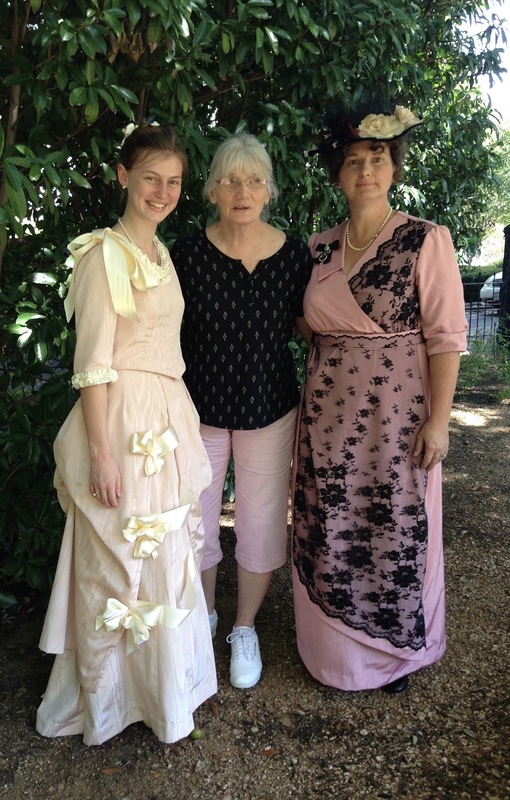 We attended a Pink Challenge tea with DFW Costumer's Guild and it was the best tea I have attended so far. The Location was outstanding a stunningly restored old home with a lovely family history of art and community involvement. 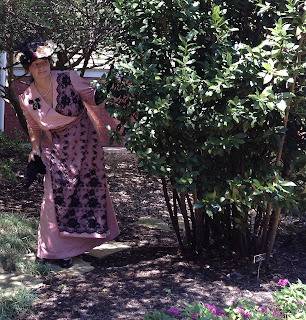 The Heard-Craig Center for Fine Arts was everything a Victorian Costumer hopes for in a tea venue. There were a lot of fun spots in the garden for photos. 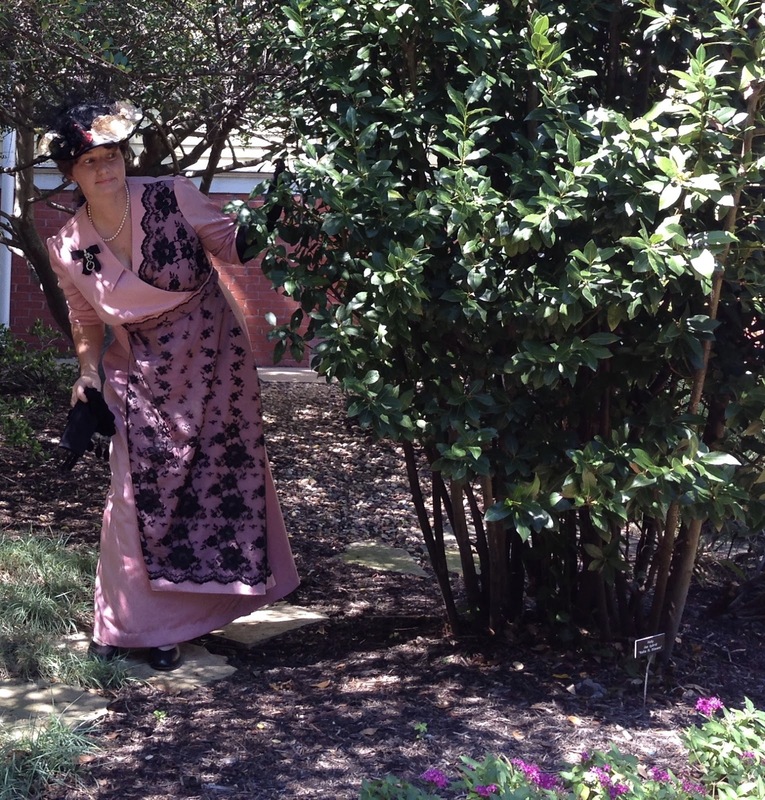 On my way to pose for the pervious photo this bush jumped out and grabbed my hat! Needless to say any concerns about me waking up with grace and elegance can now be put to rest. I'm still me. Inside the house there was the most breathtaking staircase, the fretwork over the alcove and the main hall was beyond drool worthy. Again my my grace under the fierce gaze of the camera was completely intact. My other mom is always game for dress up and loves to come to events with me. Not everyone gets to have a mom-in-law they can play with. Because of this lady I have the love of my life. I love hanging out with this kid- she is such a joy. Emily wore a paler shade of pink moire' for the tea from a bolt of fabric my Grandmother Kulaga, who was also a dressmaker, gave to me. I love the way her dressmaking continues on in my life. While I am being sentimental, I rarely go to an event without wishing my distant girlfriends could be with me. My friend Gina of Beauty from Ashes is my biggest cheerleader, always ready with words of encouragement. They usually go something like "So help me you BETTER take pictures..." but I am paraphrasing. She is also a big 'ole geek and loves to collect oddments and peculiarities. So of coarse I got excited and thought of her when I saw a locust skin on this bush. "Look G, a curious thing!" I took a great many photos and I still have not talked about my dress, or Connie's (which will be a post with a pattern review) or the food, or the OMG china cabinet- so I am going to make this a two part post and share more details on the morrow. Sleep well friends and my all your tea outings be glorious. Three events in three weeks?!? Let's get sewing. So September 17, 24 and Oct 1st are three super fun events I really want to attend. A Pink Tea, a Train Ride and a Botanical Garden Picnic. I have tickets bought, ambitious sewing lined up and my costume support buddy (Hi Gina White!) on speed text for when I need to laugh, or cry as the case may be! Let's do this thing! Now to qualify the drama I need to point out that I don't just sew for me. I sew for my super cute MIL Connie and for two of these events my daughter and guess what?! Matthew.(Squeeee!) He had so much fun at Gilbert and Sullivan he has decided he is game for dressing up again. Event one: The DFW Costumers Guild Pink Challenge Tea. Last year Colleen Swafford found this gawky rose 1980's shade of bengaline fabric and got a full bolt and then some for a steal ( I think she said it was a dollar or less a yard.) She set a challenge to our group that anyone who would like could have nine yards and see what we come up with to attend a tea one year hence. Well the date is set for September 17th and Connie, Emily and I are in. Today I made my final decision on Connie's dress. We started out with this inspiration. This dress reminded both Connie and I of her awesome pink and black dress from years ago when we did a pink ribbon breast cancer donation theme for one of the SASS conventions. It has been one of her favorite gowns- and we had pink on the brain. 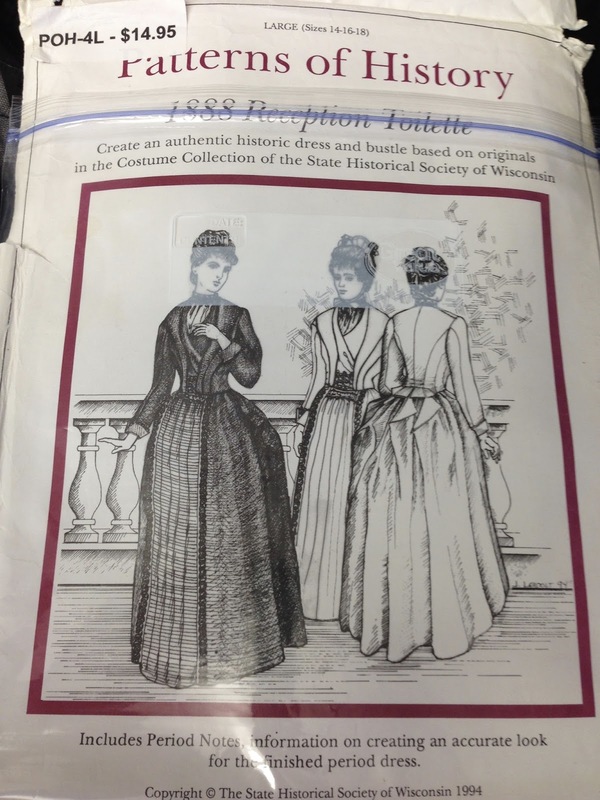 However while brain storming the modification of my much loved and much used tea gown pattern I came across this gem. I actually bought this pattern many years ago with Connie in mind and it has a lot of the elements I think look great on her. I got the two thumbs up from mom and we are off. Today I read through the instructions as this is a new to me pattern and a new to me publisher. The gown is drafted off an extant piece in the Wisconsin Historical Society's collection and graded for just a few sizes. Happily one meets mom's requirements. After getting a feel for how this thing goes together I started the process of adjusting the skirt length. Have I mentioned mom is under five foot tall? She will fib and say five foot but my measuring tape begs to differ! I typically just fold out what is needed and re-true the pattern lines. Then we decided we needed a contrast for the center skirt panel and the interesting bodice details. 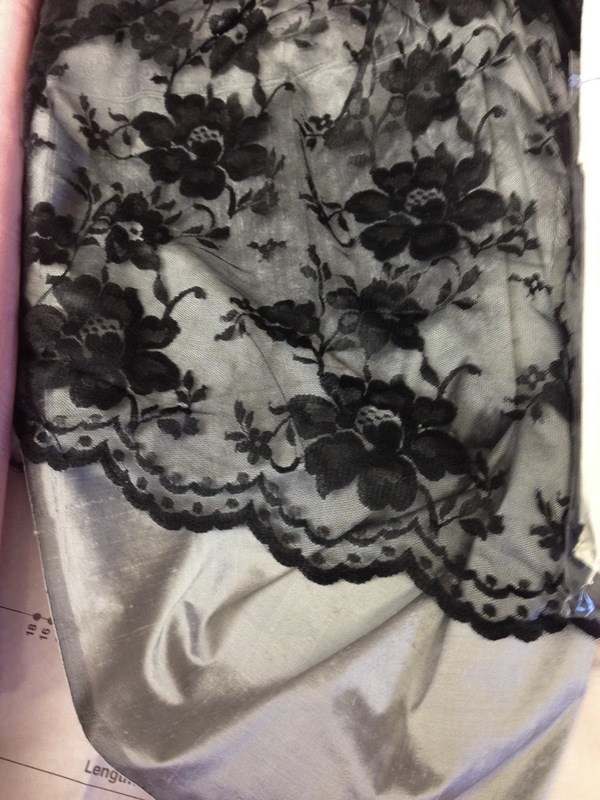 This silver silk and black lace combo is speaking to us. Woot! We have a plan and tomorrow we should have a skirt! The skirt has a very cool lining with bustle bones built right in. I am excited to give it a go. So in a nutshell that is mom's Pink Challenge Tea dress. What am I wearing you ask? 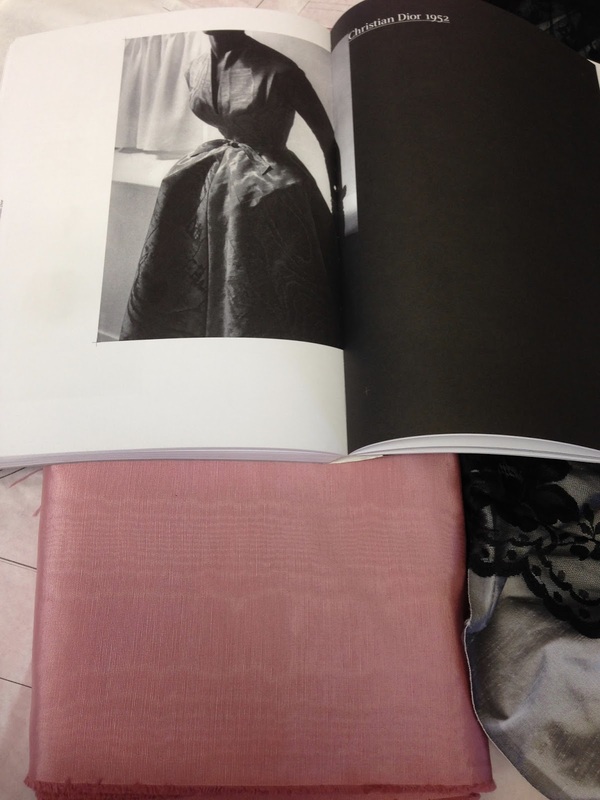 Well if the powers that be are willing I am going to drape a 1952 Dior New Look gown that just makes me smile every time I see it. That will use up the whole nine yards allotted to me for this challenge. So what is Emily wearing? She chose this dress made from a lighter Champagne Pink moire' bengaline that was part of my grandmother's fabric stash. It is my understanding that there will be other attendees in various shade of pink so Emily will fit right in with the group. The skirt is made for this already so we just have a bodice, overskirt, and some cute bows to tackle. Whew I don't know about you but a cup of tea sounds perfect right now. Until next time. What's new in your sewing room? Recently I attended Gilbert and Sullivan's "Princess Ida" in downtown Houston. 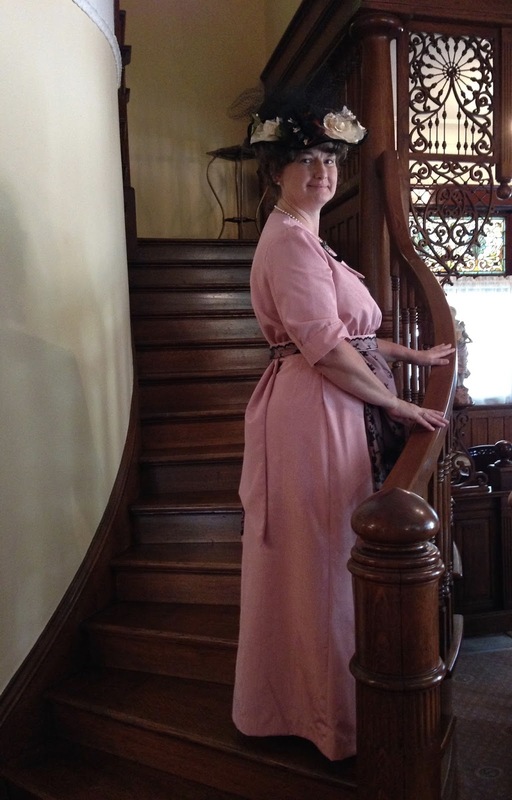 For the event we decided to make a new dress from Connie and I would wear my 1920's dress again. I wanted to bead the circles to give it a little evening umph. The beading went very well! I am always pleasantly surprised when a tedious dress making task I think will be a total nightmare turns out to be not only no big deal but oddly relaxing. Such are the games my brain likes to play with me. I chose an iridescent black bugle beed to make some clean lines around the big deco dots on my dress. Mom got a new lace overlay dress. This gown is made from the TV trumpet skirt pattern and the highly modified TV bustle era evening bodice. The closure is under the arm and there are more layers going on than I care to think about. I love the way this dress turned out but I am oh so very glad it is done! The front of the gown. We used some antique lace on the center front of the gown and the bow and belt are made in four separate pieces. My favorite part of the entire event was this guy! Matthew decided to join us and he wanted to dress as well!!! Huzzah! Squee! Really?!?! JOY! 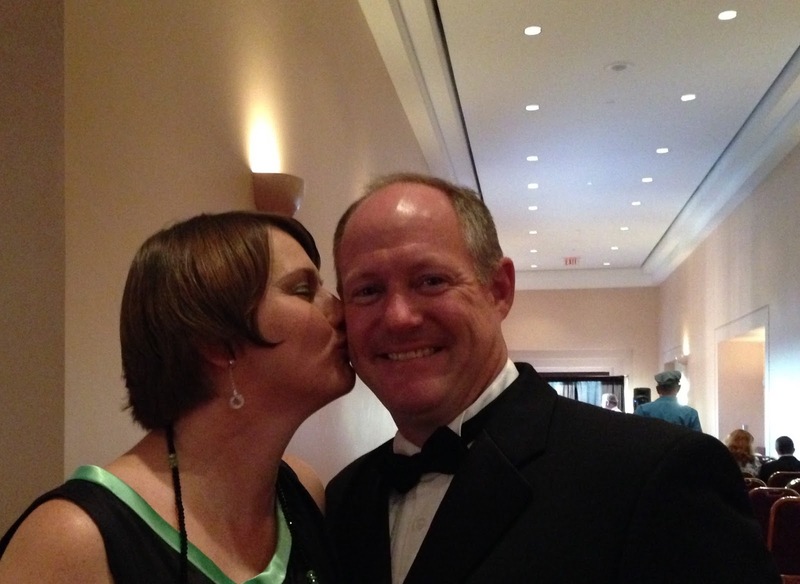 Look how good the Hubbie cleans up! Swoon. I found his tux at the very first thrift store I tried and it was $21 for the coat and pants. I found a silk satin vintage bowtie the very same day in the first Antique shop I looked in for $6. I added a brand new formal shirt $24 and a perfect white satin vest 14$ With the $10.50 for dry cleaning I was over moon that I was able to pull this perfectly fitting (did I mention the tux was a perfect fit -no alterations?!?!) for mere $75.50. It is a sharp look and he can absolutely wear it again. I made the pocket square in a green to match my dress from the same satin that is on my collar. The shoes she has on are a perfect color match and another thrift find for $5 - the girl has a good eye! In our seats and ready to enjoy the show! So then after the show we planned to take lots of pictures. Pictures of the historic theater, the stunning huge floral arrangements, pictures on the outstanding green velvet deco couches with slick mirrored walls in our 1920's outfits. A decent picture of the total pain to create 1920's curls around my face that have the equivalent to concrete hairspray on. Yes dear ones perfect spots were scoped out and plans were in place..... Then this happened. So every couple has their crazy stories and we are no exception. Many many many moons ago Matthew took me to me favorite restaurant and over dinner starting asking me very significant questions "How important was my Catholicism to me?" "Did I want children and how did I feel about working v/s being a stay home mom." All of the sudden it dawned on me and I blurted out "Are you going to ask me to marry you?!?" In stunned shock Matthew replied "Eventually." I laughed, he laughed, and we just started planning our wedding. Of coarse I always wondered how my proposal might have looked had I not been my typical all out there self. Ah well. Over the years it has been a bit of a joke between us that I ruined my chance and no amount of teasing could get Matthew to utter the words "Will you marry me?" So imagine my utter and absolute shock when, while trying to tell him to button his coat for a photo he pulled out the traditional black velvet box and took to one knee. WORTH EVERY MINUTE of the 20+ years I hoped and waited. There has never been any answer but YES in my heart for this man. As I close this post I pray everyone in the world can be as happy as I am at this moment and each day with my love. It was a very good night indeed, may God give us many many more.